Since I’m about to embark on my latest adventure (two weeks in Miami, followed by two weeks in Arizona), I thought I’d better finish writing up my final set of flights from last year. 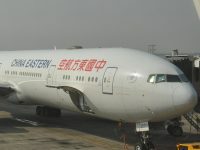 In the first part of this instalment of Brian’s Travel Spot, my occasional series documenting my increasing travel experiences, I told you about my experiences flying to Shanghai in business class with China Eastern. This one’s all about the flight back. I spent a week in Shanghai for work before catching the world’s fastest inter-city train to Beijing, where I spent a few days, then caught the sleeper back to Shanghai, where I spent a few more days before flying back to London on the equivalent return flight with China Eastern (which has one flight a day between London and Shanghai, as do British Airways and Virgin). You can see how I got on after the gallery. Before I talk about the airport and the flight itself, a word about getting to/from the airport and about travelling around Shanghai in general. Shanghai has two airports, Hongqiao and Pudong. Hongqiao is the older airport, to the west of the city, but relatively close to the centre, and near the new train station where I caught the high-speed train to Beijing. It serves mostly domestic services and I flew into/out of Hongqiao on my first visit to Shanghai (I flew in from Hong Kong and left to go to Chicago via Beijing). This time I flew in and out of Pudong, which is to the southeast of the city and much, much further out. The good news is that both airports are relatively easy to get to/from on public transport. Given the anecdotal stories I’ve heard from colleagues about horrendous traffic and taxi drivers going the wrong way to run up the meter, I’m inclined to say the public transport is the way to go. It’s certainly cheaper than a taxi and no slower. Also, if my experience is anything to go by, you will be hassled by taxi drivers who will lie to you to get a fare. The two I was told at the airport were that there are no cash machines that take foreign cards at the airport and that the Maglev line (see below) is cash only, an issue because I arrived with no Chinese currency, the Yuan (¥). Back to public transport. The airports are at either end of Metro Line 2 (Hongqiao is also served by Line 10, which I used on my previous trip to Shanghai). It takes about an hour to get to Hongqiao from the centre and about 1½ hours to get to Pudong going the other way. If your destination isn’t anywhere on/near Line 2, don’t worry: it has plenty of other connections to the rest of the excellent metro system. It’s worth saying that I found the Shanghai (and Beijing) metro one of the easiest to navigate and travel on. The signs are all in English (and Chinese, obviously) and many of the announcements are too. If I ever get to write up my experiences travelling in China, I’ll have more to say about this. For now, I’ll limit myself to four observations (the first three of which apply to both cities). The first is that the metro is invariably busy. I got a seat on a couple of occasions, but mostly I was standing. The second is that you always have to go through a cursory security check as you enter the metro. This involves putting your bags through a scanner and having a wand run over you. It’s not as intrusive as it sounds though and I never had to queue, regardless of how busy it was. My third observation is that it’s extremely cheap, usually ¥3/4, (about 50p) for getting around the city centres (which can include quite long journeys), while a run out to the airport might cost you ¥8 (£1). Finally, while both metros have smartcard payment systems, the two don’t interoperate and charging up the smartcard is absurdly difficult in Shanghai for foreign visitors. So, back to the airports and specifically Pudong. Although you can get to Pudong on Line 2, this takes about 1½ hours from the centre and you invariably have to change trains even though it’s the same line. A much better option, in my opinion, is to take the Maglev train. This runs to Longyang Road, where it connects up to our old friend, Metro Line 2, as well as Lines 7 and 16. It takes 7 to 8 minutes and, even accounting for the time spent waiting for a train (they are every 15 minutes) and switching between the Maglev and the Metro, you shave at least 30 minutes from your journey. Best of all, you get to travel on the fastest passenger rail service in the world, with speeds of up to 360 km/h, although it only reaches these speeds during certain windows during the day. It is a little more expensive, at ¥40 (if you show your plane ticket, ¥50 otherwise) for a one-way trip, but that’s only £5-6 and (I think I might have mentioned this already) YOU GET TO TRAVEL ON THE FASTEST PASSENGER RAIL SERVICE IN THE WORLD! My flight left at 13.00, which, initially sounds like it’s quite late in the day. However, this realistically means trying to be at the airport for 11.00, which means looking to leave the hotel at 9.30 (even including travelling by Maglev), which means getting up at 8.00 if you want breakfast and have time to pack. Now I know plenty of people for whom 8.00 is a lie-in, but for me, it’s an early start! As it was, I got up at 8.30, pottered about perhaps a little longer than I should have, eventually leaving the hotel at 10.10. It took five minutes to get down to reception and check-out (I was staying at a big hotel), plus it was a 10-minute walk to the Metro at Shanghai Station, so it was 10.25 before I was properly underway. I could have gone on Line 1 and then changed to Line 2 to get to the Maglev Station at Longyang Road, but that would have involved another five minutes’ walking (it’s on the far side of Shanghai Station) so I went on Line 4, changing onto Line 2 at Century Avenue, just three stops from Longyang Road. From there I caught the Maglev to the airport. If you’re keeping track, from arriving at the metro at Shanghai Station to Pudong Airport took almost exactly one hour. The trip on the Maglev train was excellent. Since it only runs between Longyang Road and Pudong Airport, it’s rather hard to go wrong. Also, in contrast to the metro, the two times I caught it, it was never busy, so I had a set of six seats to myself. It’s also a lot more comfortable than the metro, but don’t get too comfortable, since you’re only going to be on there for eight minutes at most! My only regret is that I missed out on going at 360 km/h, with both my journeys only attaining a maximum speed of 300 km/h. You can see what I made of Pudong Airport after the gallery. If you’re flying business class (insert smug face here), you have your own check-in area, which is just as well since the queues for economy next door were enormous, whereas there were only two people ahead of me in business check-in. You even get your own door at the back which I was hoping led to a VIP channel through security, but no such luck. Instead it just feeds you into the general immigration/security queue. So far, everything had gone swimmingly. From leaving the Maglev Station to exiting check-in had only taken 15 minutes. Unfortunately I had forgotten that there are thorough immigration checks before you can leave China, which results in long queues. The only plus side is that this throttles demand for security (which comes next) so you effectively spend the time you would normally waste in the security queue in the queue for immigration instead. As it was, I was through both inside 35 minutes, most of it spent queuing for immigration, where, unfortunately, there is no priority channel for business class (remove smug face). Security was the same old rigmarole of taking everything off/out of your bags and, sadly, this is one area where Pudong, for all its modernity, is very backwards. There’s nowhere to unpack your stuff and put it into the trays at the start of the process and nowhere to gather up your stuff and put it all back together at the end. Other than that, the process was fine. My flight was nominally boarding at 12.15 and I cleared security at 12.12, so actually arrived at the gate bang on time. Naturally there was no sign of anyone boarding, but there was already a long queue for economy. However, one of the perks of flying business class is lounge access, so I went off to find the China Eastern lounge (reinsert smug face here), which was a few minutes’ walk away. Sadly I couldn’t stay long, but it looked very nice, with a busy dining area off to the right, and a much quieter self-service drinks area off to the left. I popped in there to make myself some coffee with my Aeropress (there was a handy hot water dispenser set to 90⁰C). Had I had longer, I would have stayed there to drink it and made use of the power and free Wifi, but as it was I took my coffee down to the gate in my Therma Cup (and very nice it was too, a Honduran single-origin that my friend Bex of Double Skinny Macchiato had brought back from Peoples Coffee in New Zealand for me: a very well-travelled coffee indeed!). You can see how I got on during the flight itself after the gallery. When I returned to the gate, the queues had dissipated and I went straight on. This was pretty much what I would have done had I been travelling in economy, the only difference is that I would have had to wait down by the gate and tried to sweet talk the two nearby (chain) coffee shops into letting me have some hot water for my Aeropress (something I’ve done before). Unlike the flight out I’d checked in on-line this time, but I’m not sure it made much, if any, difference compared to checking in at the airport. It did, however, take up 15 minutes of my Saturday evening and, on the plus side, gave me a choice of seats. I could have had a window seat somewhere towards the back of the main business class section, but in the end I decided to go for the same seat that I had on the flight over, 7D. In the interests of research I should have seen what the other section of the cabin was like, but I was very happy with the seat on the way out so I decided to stay put and didn’t regret my decision. I was flying on another Boeing 777-300ER with the same configuration as the flight out (I didn’t think to check if it was the same plane) so there’s not a lot I have to say about the plane itself that I didn’t already say on my way to Shanghai. There were a few minor differences though, but these were all to do with the service. This time our little section was full, but it didn’t make much difference. I was also offered a set of pyjamas, which is odd since I don’t remember that on the way out, which an overnight flight, while this was a daytime flight. However, I said yes since I figured they would make a neat souvenir. Of course, it being a daytime flight didn’t stop the crew coming through 20 minutes after take-off, pulling down the blinds and turning the main cabin lights out. It really annoys me to be sitting in the dark in the middle of the afternoon when it’s still light outside. It was particularly galling since maybe one person of the eight of us in our section was trying to sleep. I’m sure this is a relatively recent thing and didn’t used to happen during the trans-Atlantic daytime flights I took to the USA even five years ago. I’m off to Miami (in economy) on Monday, so I will have to see what happens there. The only plus point was that, being in business class, I discovered that I actually had two personal lights, a harsh one to my right/behind me (similar to the one in economy) and a gentler one in the ceiling above me which I took to using since it gives better illumination and doesn’t give me such a headache. As I never tire of saying, the flight was smooth and uneventful. With a projected flying time of just under twelve hours, I knuckled down and did some work, interspersing that with meal-breaks and watching a movie (Dunkirk) on the (very) big screen. Dinner (all five courses) was served soon after take-off, then we had a snack roughly halfway through the flight, and a two-course lunch not long before we landed, while I also got some hot water from the galley to make coffee with my Aergrind and Travel Press. Although I didn’t use the seat as a bed (by the time it was evening, Shanghai-time, we were only three hours from London, so it really didn’t seem worth trying to sleep), having a large, stable table for my laptop, plus plenty of room for my stuff (not to mention room to spread out) was a real joy. I’m still not sure I’d pay £750 for it if I was footing the bill myself though! Although the projected flight time was a shade under 12 hours (which turned out to be remarkably accurate) we were on the plane for closer to 13½ hours. We pushed back on time at Shanghai, but the taxied for around 20 minutes and then spent another 20 minutes or so waiting at the end of the runway before finally taking off at 13.40. We landed at 17.38, London time (1.38 in the morning in Shanghai) but then spent forever taxiing around Heathrow. The UK, it seemed, had had snow while I was away and, as usual, wasn’t coping very well. We finally found somewhere to park (ie, we got to the gate) at 18.30. These were, however, minor annoyances. I don’t know what it’s like back in economy, but on the basis of my experience in business class, I’d very happily fly out to China with China Eastern again, including flying economy if I was paying for it. If you’re interested, the Travel Spot has a page dedicated my trip to China in 2017. This includes all the flights and train journeys I took, along with all the Coffee Spots I visited along the way. Don’t forget that you can share this post with your friends using buttons below. This entry was posted in Brian's Travel Spot, Shanghai and tagged Boeing777, BusinessClass, China2017T2, ChinaEastern by Brian Williams. Bookmark the permalink.